Okay – I know what you are thinking…Why would I condone slathering refined sugar on a perfectly good meal? Well first of all – most of my jams and jellies are LOW SUGAR. So I am really talking about slathering a meal with seasonal fruit flavor and natural fruit sugars. But more importantly, just think about how well cranberry sauce spruces up a slice of turkey and you understand how sweet, sour and savory can all play well together on the dinner plate. I’m telling you, a scoop of jam from the bottom of the jar can take ordinary meals to a whole new level of yumminess. And the best part? It is easy! 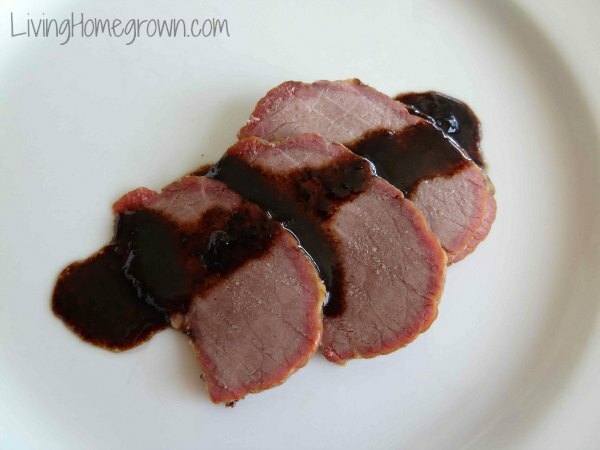 Here are two techniques that you can use to get your “jam on” when it comes to meat dishes. And if you are vegetarian, well…jam can still be used in a ton of ways for you too. Try peach jam on a grilled veggie sandwich or plum jam in a stir-fry and there is the whole salad dressing thing. The idea here is to think of what fruits mesh well with a particular food flavor and then getting creative with that. If you give your jam as gifts, be sure to share different ways your friends can use the leftovers from that jam. Most people don’t think past the toast angle and honestly, there are SO many other possibilities. It is all about the flavor and how best to harness it. So let’s get crack’n! Keep in mind that it is not just about JAM. You can use jellies, marmalades and other preserves to create sauces in your cooking. So when I say add a spoonful of jam, remember that you can substitute other fruit preserves as well. People sometimes get confused about the difference between deglazing the pan and making a reduction sauce (I know I did when I was first in cooking school). 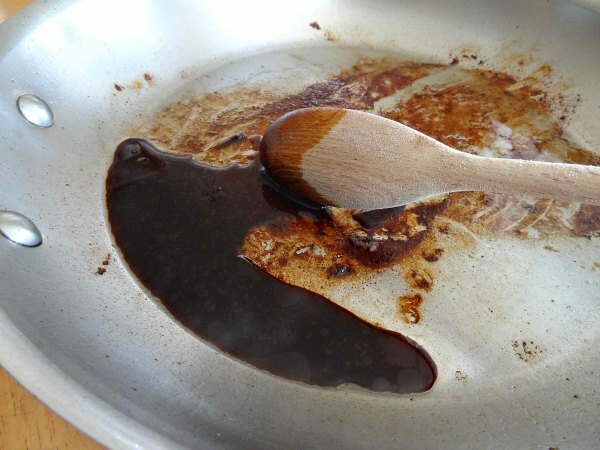 Here’s the deal: Deglazing a pan is the first step in creating a reduction sauce – so they are actually related. But either one can be used on their own. 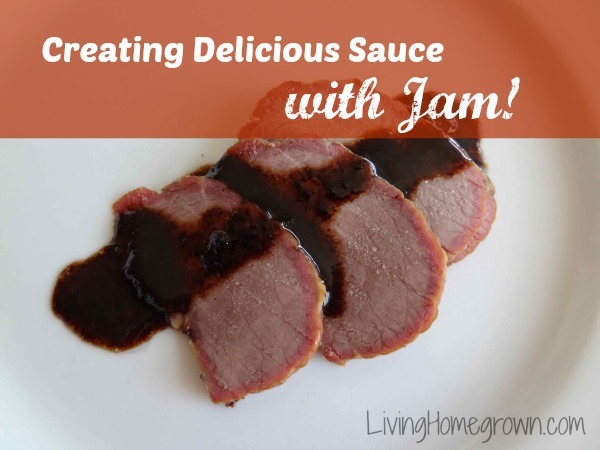 When you are in a hurry, you can just deglaze a pan (instructions below) and add some jam to create a fast and simple sauce that can be poured over meats. If you have a bit more time or if you need more than a 1/3 cup of sauce, continue on to make a full-blown reduction sauce that will blow your taste buds away. It is also easy, but takes a bit more time. However, you are rewarded with more depth of flavor. Below I’ve outlined each so you can pick the method you want based on your time and how much sauce you need. And remember…just about any jam/jelly or marmalade will work. This is by far one of the easiest ways to add flavor to what is just an ordinary meal. 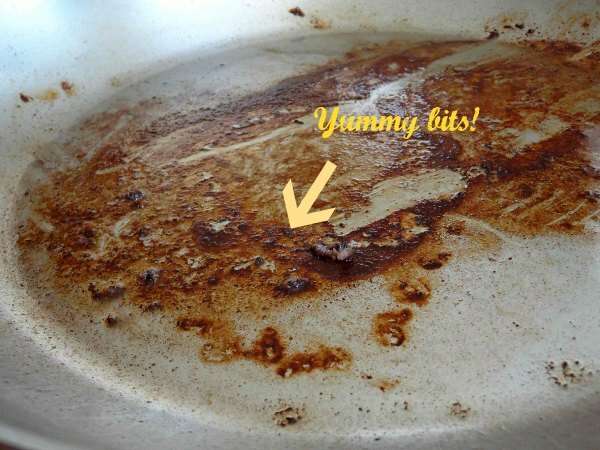 Any time you cook a protein in a pan (chicken, beef, pork, etc), there are little brown bits and some juice/fats at the bottom of the pan. To capture that flavor and create a great sauce, you only have to heat the pan, add a cold liquid and scrape off the bits. Ever made gravy? Well, then you have deglazed the pan. Easy peasy. After cooking your meat, remove it from the pan. If there is a lot of fat, remove all but a few tablespoons. The liquid will immediate start to boil and that will loosen the brown bits. Use a spatula or wooden spoon to scrape off the bits. Continue cooking until the liquid reduces a bit. At this point you are really done “deglazing the pan” but if you add some jam and a bit of cream or butter, you have a sauce…So continue on to step 6. Add in 1-3 Tablespoons of jam. My favorite choices are apple, apricot, berry, peach, pear, pineapple, or plum. But seriously, they all work. Heat just until the jam dissolves. Add a dollop of butter or a splash of cream if you wish. Add salt and pepper to taste. Pour over the meat as you serve. YUM! 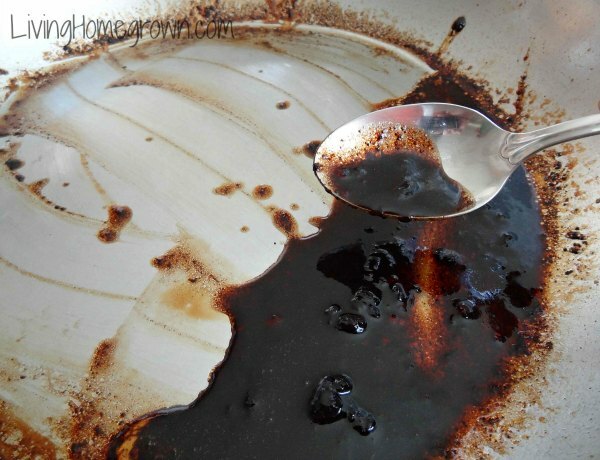 A reduction sauce starts with the deglazing of the pan (step 1 through 4 above), but then you add a different liquid (usually a broth or stock) and reduce again. (Technically, you can just add more of the same liquid but to me it is all about layers of flavor so I add something different.) I like to use wine to deglaze and add stock to reduce. You can also saute some garlic or shallot during the deglazing process and some fresh herbs at the end. A reduction sauce is a time to go all crazy with layers of flavor. 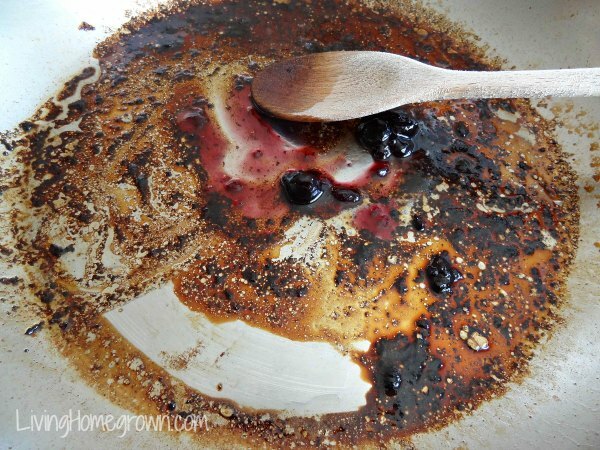 Follow steps 1-4 above for deglazing the pan. At this point you can saute’ some minced garlic or shallot in the reduced liquid, but it is completely optional. Add in 1-3 Tablespoons of jam. (See above for suggestions) Heat just until the jam dissolves. At this point you can add 1/2 tsp. of freshly chopped herbs. Was there a particular herb you used on the meat? Add that. Or pick something complementary. My favorites are rosemary, thyme and basil. Remember that a little goes a long way. Pour over the meat as you serve. This is a small slice of heaven! Do you do anything unusual with your jam? If so, I’d love to hear other ideas on using up the jam in my pantry. Or are you just a jam on toast kind of person? No worries! But tell me… What is your absolutely favorite jam on toast? What jam makes your toes curl with delight? Mmmm a huckleberry version sounds lovely Paul. I made some peach jam that didn’t come out quite right, but it’s been useful in a pan sauce like this one. Thanks! I’m looking forward to trying with Loquat and Prickly pear preserves for a Sicilian celebration. Both fruits are native to Sicily (and the west) Keep you posted!